Many of us aspire to a beautiful smile. A smile reaches many and has an infectious quality to it- when we smile at someone, they will very often smile right back at us. Our smile is our sign to the outer world that we are OK; if we can stretch out and upturn the edges of our mouth we are doing something right. The condition of our teeth often stands in the way of our laughing smiles- when we don’t feel secure in expressing that very human emotion then we somehow feel less beautiful. We only get one set of adult teeth so we need to value and take care of both our teeth and our general oral health. 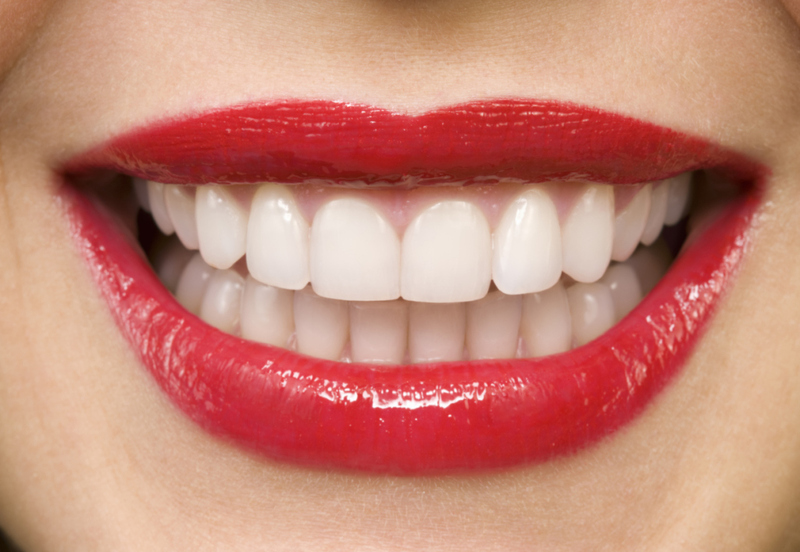 Having healthy, white teeth and a super smile simply requires a focus and tender loving care. Here are some ways you can create a more youthful and vibrant appearance through whiter and happier gums and teeth! We don’t need to wait for a 6-monthly check up at our dental hygienist to look after and clean up our teeth. We can pour some love into our dental health and check our gums and teeth regularly, notice any differences in the overall look and feel of our gums and teeth, and ensure we choose beneficial products to keep our oral health in good condition. As with most things, a natural way forward is always better. Many kinds of toothpaste contain chemical ingredients that hinder our journey toward a more organic and natural way of life. When we shop for oral health products we can exercise a little discernment so we know exactly what we are buying and we can proactively seek what is best for us- rather than what is a quick fix. The acidity found in high sugar foods and drinks literally corrodes the enamel on our teeth. When we are mindful of the foods we eat we inspire better overall health which extends to the smaller areas of our body like our mouth. A varied diet which includes lots of the good stuff like fruit, vegetables, vitamins, and minerals helps to prevent gum disease and tooth decay. Eating some cheese or perhaps ending a meal with some can assist in reducing the harmful effects of acidic foods. Prevention is always better than a cure though- so it pays to enhance your nutrition. • Brush teeth at least twice a day- and always before bedtime! So there we have it, a few key tips to help you on your way to a great smile that you are comfortable and confident to share! According to a recent British study, having whiter teeth not only makes you look more successful and attractive, it also makes you look at least five years younger. Remember that having a healthy, attractive smile isn’t just good for your looks and confidence; maintaining a healthy mouth and teeth provides added protection against a number of medical disorders including heart attack and stroke. One exciting health company that has been quietly earning a solid word of mouth reputation for stemming the tide of poor oral health for the past ten years is Ascended Health. They delight customers by improving their smiles with their uniquely energizing Oralive probiotic dental paste – not to mention an entire range of forward-thinking healthy and beauty products. Founded by a microbiologist who has spent over 30 years researching how indigenous foods and their ecology of microflora help stave off disease, detoxify the body, and increase lifespan, Ascended Health’s mission is to develop effective plant-based extracts into a bio-intelligent format that is eco harmonic to both the body and spirit through the processing of microbes from longevity zones with the infusion of intention and conscious vibrational frequency. Unique among dental products, Oralive’s ingenious formulation was specifically designed to help balance oral health on two critical levels: the physical plane and the emotional energy body. 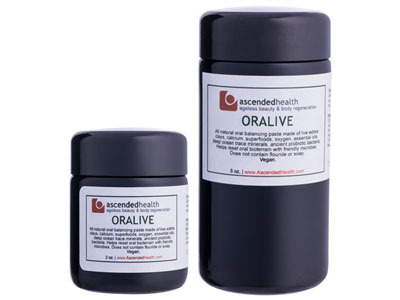 On the physical level, Oralive contains a powerful combination of highly oxygenated and ozonated essential oils, along with potent natural antioxidants and herbal extracts are known to aid gum health. The use of natural calcium and growth enhancers from marine phytoplankton and blue-green algae combine with a liposomal formulation of natural vitamin C from Camu Camu and amla, these encourage natural healthy regeneration of gum tissue. The inclusion of clove oil and fermented turmeric (which is a known cox-2 inhibitor), also provide effective management of and relief from gum pain. Because of this, there is no need for fluoride to stave off cavities, as ingredients in Oralive have been shown to do so naturally. Oralive is one of the first oral dentifrices on the market to promote a healthy oral microbiome via the inclusion of microbes that have been shown to help the body maintain optimal natural flora in the mouth and control over pathogenic species that cause cavities and disease. The addition of ancient desert bentonite clay rich in fulvic acid and activated charcoal, which are known chelators of heavy metals and other toxins, contribute to the paste’s characteristic “licorice black” look as well as its superb cleansing action and ultra-whitening and superb effect. Testimonials abound from customers proudly sharing the delighted reactions of their dental hygienists regarding the gleaming health and cleanliness of their teeth during their 6-month periodic check-ups. On the emotional level, Ascended Health’s proprietary method of imprinting the nutrients, Co-Q-10, and essential oils with specific scalar vibration energies from Lemurian quartz crystals during the aging of each batch has resulted in numerous reports from customers that Oralive helps their body maintain balance and a feeling of increased energy. Indeed, many routinely start their day by swishing their mouths with a dab of Oralive early in the morning for its pleasant and uplifting effects. Finally, and best of all, Oralive is not mass manufactured, but rather, is hand-prepared, batch by small batch, in artisanal fashion in Ascended Health’s state-regulated manufacturing facility. It has been mindfully designed according to Golden Mean ratios to produce the proper harmonics when blending its all-natural ingredients. To ensure the optimum level of vibrational resonance, the aging room is a low EMF environment lined with Brazilian black tourmaline tile. Ascended Health’s natural, holistic approach to well-being is predicated on one simple, central concept: to utilize science, consciousness, and nature as a blueprint to heal ourselves. “We believe, there is simply no other dental paste in the world with as much technology and mindfulness that has gone into its manufacture,” said Ascended Health.